6 6 Introducing Symantec Enterprise Vault About Vault Cache , and copy or move it to another folder. Your administrator can configure Enterprise Vault so that shortcuts expire after a certain time. An expired shortcut disappears from the mailbox, but the archived item is still in your vault. If your administrator has enabled it, Outlook displays your vault as a Virtual Vault in the Navigation Pane. 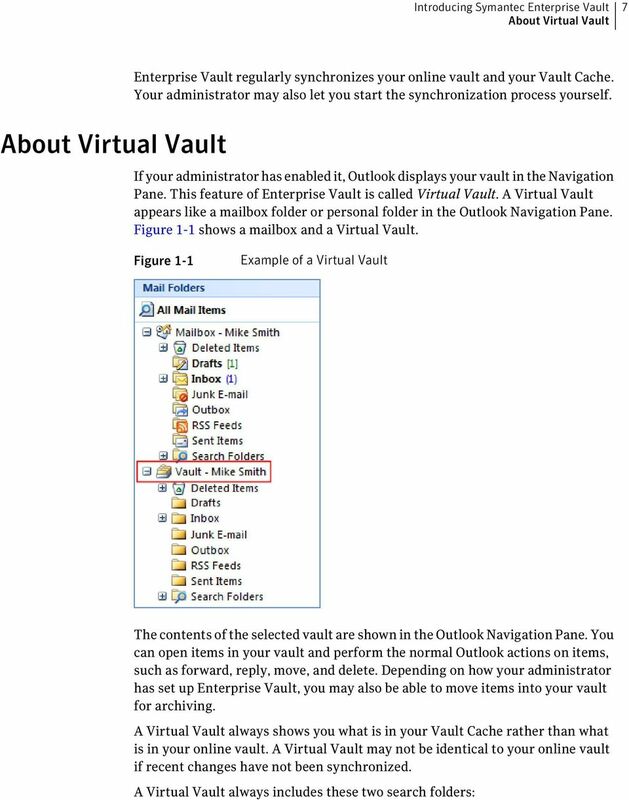 The administrator can set up Enterprise Vault so that it archives Outlook items other than s. If so, you may see archived Outlook calendar items, tasks, contacts, or notes in your Virtual Vault in the appropriate folder view. Although archiving is automatic, you can choose to store items in the vault yourself at any time. 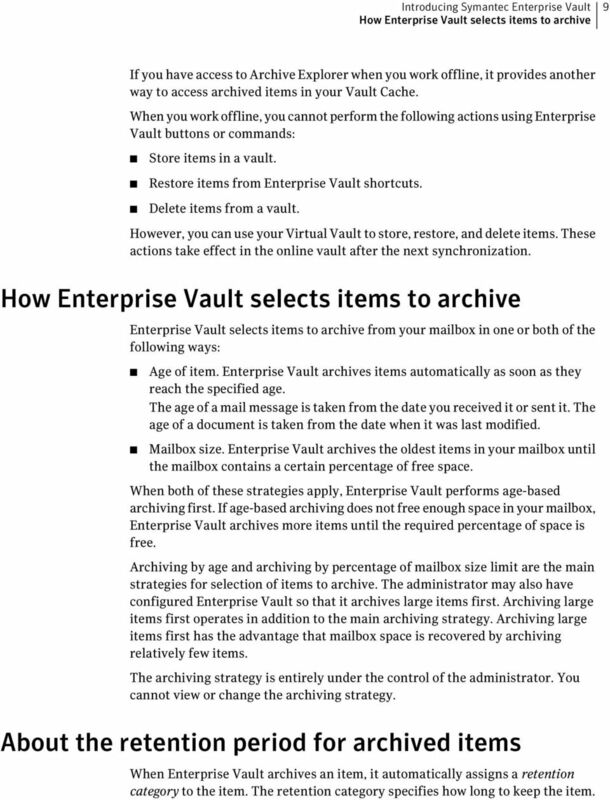 When you store an item, Enterprise Vault adds it to your vault as an archived item. Enterprise Vault treats the items that you have stored in the same way as any other archived item. You can also choose to restore archived items; that is, to move or copy archived items back into your mailbox in their original format. You do not need to restore archived items to forward them or reply to them, or to perform other actions. Enterprise Vault does not normally archive any information that is held in your personal folder (PST) files on your computer. However, your administrator can archive these items for you. Contact your administrator if you have items in any personal folder files that need to be archived. About Vault Cache Your administrator can make the Vault Cache feature available to you. A Vault Cache is located on your computer, and contains copies of the items that are in your online vault. You need a Vault Cache if you want to do the following: Access archived items from shortcuts when you are not connected to your corporate network. Use Virtual Vault. Your administrator can choose whether your Vault Cache stores complete archived items or partial archived items. You cannot change this option. A partial archived item includes enough information for Virtual Vault to display it in the Outlook item list, but not the item's full content. If your Vault Cache stores partial archived items, Enterprise Vault retrieves the full content from your online vault when it is required. For example, Enterprise Vault retrieves the full content of an archived item when you open the item from Virtual Vault. The type of Vault Cache (that is, whether it stores complete archived items or partial archived items) affects the accessibility of archived items when you work offline. 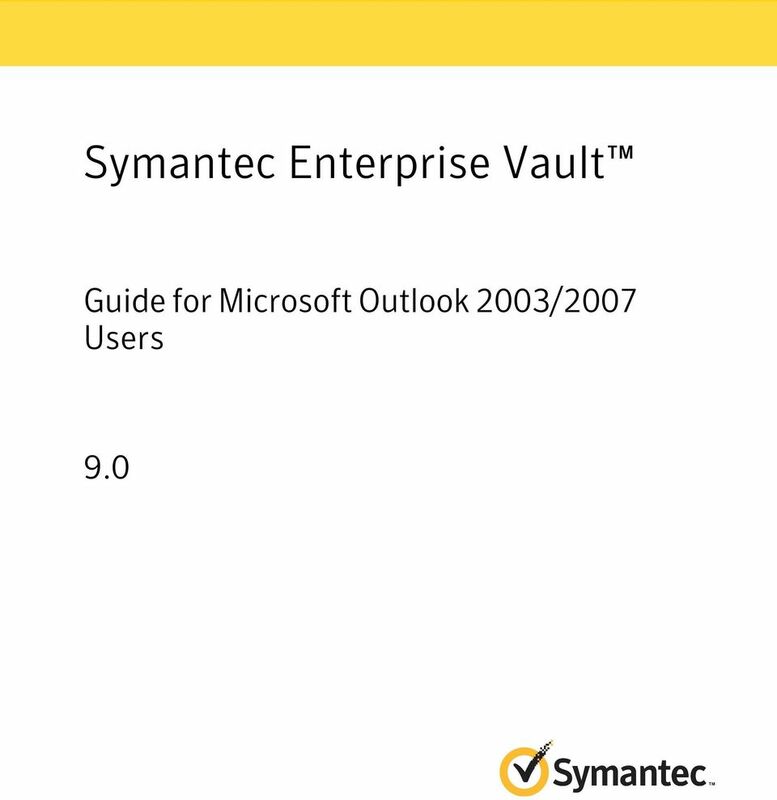 8 8 Introducing Symantec Enterprise Vault About working offline Could Not Archive To Archive Lists items that Enterprise Vault could not archive when it synchronized your Vault Cache with the online vault that is associated with your Outlook mailbox. Lists items that you have moved or copied into your Virtual Vault and that are awaiting archiving. The folder does not include items that Enterprise Vault could not archive for any reason. Note the following points about Virtual Vaults: You may be able to view the contents of shared archives, delegate archives, and Exchange managed folders in your Virtual Vault, but you cannot modify the contents in any of these cases. A Virtual Vault cannot contain public folder items. You cannot modify items by, for example, changing the content or read status, adding a flag for follow up, and so on. You may be able to move, delete, and rename Virtual Vault folders, but only if the folders do not exist in your mailbox. You cannot display the properties of a Virtual Vault folder. About working offline When Enterprise Vault archives an item from your mailbox, it normally leaves a shortcut that links directly to the archived item. Replacing items with shortcuts saves space in your mailbox. However, if you work offline or you are not connected to your corporate network, double-clicking a shortcut cannot open the item in your online vault. A Vault Cache provides instant access to archived items, even when you work offline or are not connected to your corporate network. After you have set up a Vault Cache, you can retrieve archived items in the following ways: Open the items from the corresponding shortcuts in your mailbox. Open the items from your Virtual Vault. Note that your administrator may have set up your Vault Cache so that it stores partial archived items. With this type of Vault Cache, the full content of archived items is inaccessible when you do not have a connection to your online vault. Another possibility is that your Vault Cache stores both partial items and the full content of items that you have opened when you work online. In this case, you can open any previously opened items, even when there is no connection to your online vault. 9 Introducing Symantec Enterprise Vault How Enterprise Vault selects items to archive 9 If you have access to Archive Explorer when you work offline, it provides another way to access archived items in your Vault Cache. When you work offline, you cannot perform the following actions using Enterprise Vault buttons or commands: Store items in a vault. Restore items from Enterprise Vault shortcuts. Delete items from a vault. However, you can use your Virtual Vault to store, restore, and delete items. These actions take effect in the online vault after the next synchronization. How Enterprise Vault selects items to archive Enterprise Vault selects items to archive from your mailbox in one or both of the following ways: Age of item. Enterprise Vault archives items automatically as soon as they reach the specified age. The age of a mail message is taken from the date you received it or sent it. The age of a document is taken from the date when it was last modified. Mailbox size. Enterprise Vault archives the oldest items in your mailbox until the mailbox contains a certain percentage of free space. When both of these strategies apply, Enterprise Vault performs age-based archiving first. If age-based archiving does not free enough space in your mailbox, Enterprise Vault archives more items until the required percentage of space is free. Archiving by age and archiving by percentage of mailbox size limit are the main strategies for selection of items to archive. The administrator may also have configured Enterprise Vault so that it archives large items first. Archiving large items first operates in addition to the main archiving strategy. Archiving large items first has the advantage that mailbox space is recovered by archiving relatively few items. The archiving strategy is entirely under the control of the administrator. You cannot view or change the archiving strategy. About the retention period for archived items When Enterprise Vault archives an item, it automatically assigns a retention category to the item. The retention category specifies how long to keep the item. 10 10 Introducing Symantec Enterprise Vault About the retention period for archived items Your administrator can set up different retention categories for different types of data, such as Business or Legal. As Enterprise Vault monitors the vaults, it can then delete any item whose retention period has elapsed. Retention categories are entirely under the control of the administrator. You cannot view or change retention categories. 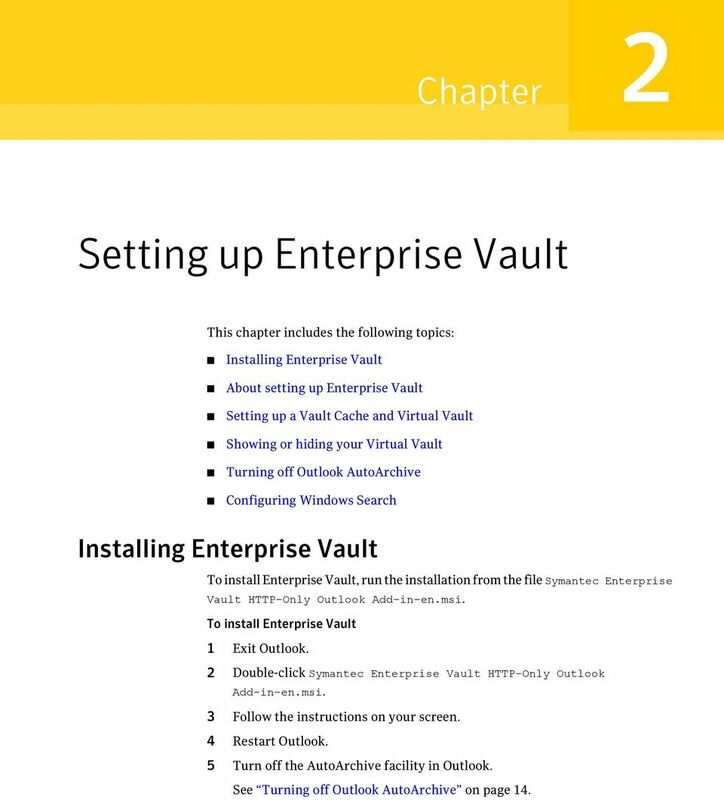 11 Chapter 2 Setting up Enterprise Vault This chapter includes the following topics: Installing Enterprise Vault About setting up Enterprise Vault Setting up a Vault Cache and Virtual Vault Showing or hiding your Virtual Vault Turning off Outlook AutoArchive Configuring Windows Search Installing Enterprise Vault To install Enterprise Vault, run the installation from the file Symantec Enterprise Vault HTTP-Only Outlook Add-in-en.msi. 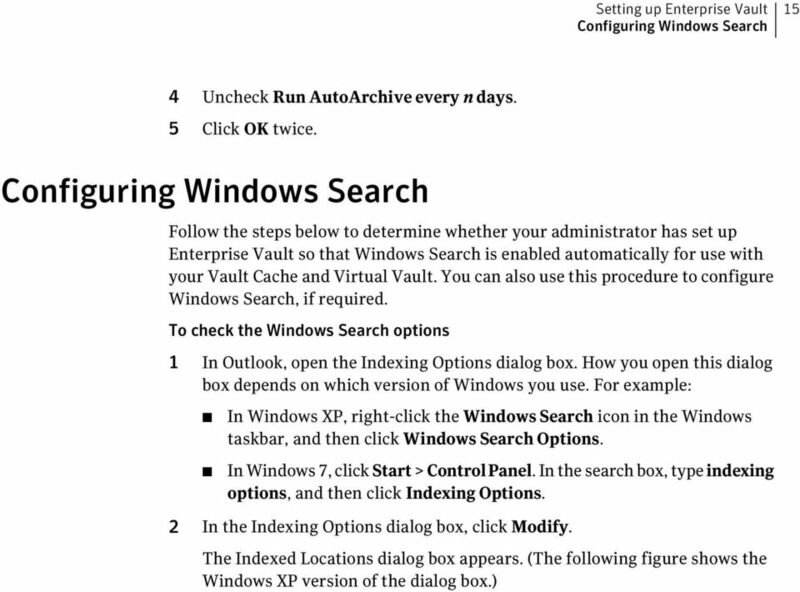 To install Enterprise Vault 1 Exit Outlook. 2 Double-click Symantec Enterprise Vault HTTP-Only Outlook Add-in-en.msi. 3 Follow the instructions on your screen. 4 Restart Outlook. 5 Turn off the AutoArchive facility in Outlook. See Turning off Outlook AutoArchive on page 14. 12 12 Setting up Enterprise Vault About setting up Enterprise Vault About setting up Enterprise Vault After Enterprise Vault is installed, it is immediately ready to use. However, if you want to use Vault Cache and Virtual Vault, you may need to do some further setting up. If you can see your Virtual Vault in the Outlook Navigation Pane, you do not need to set up either the Virtual Vault or a Vault Cache. 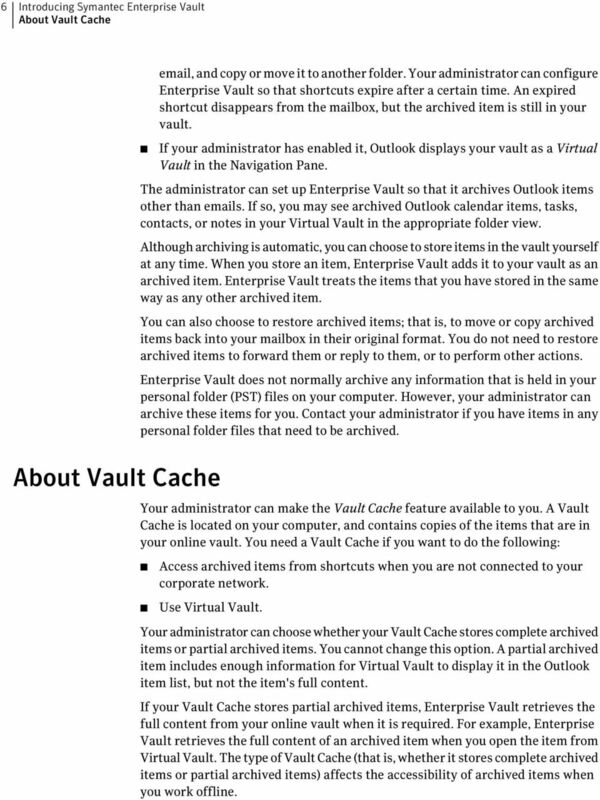 If a Virtual Vault does not exist, but your administrator has configured Enterprise Vault to let you use it, all you need to do is set up a Vault Cache. 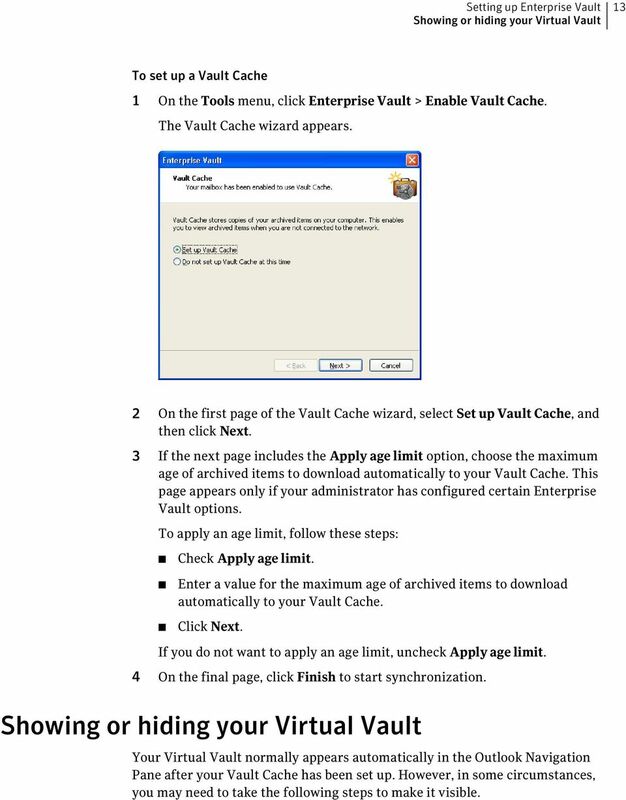 Setting up a Vault Cache and Virtual Vault If a Vault Cache is not already set up, you can run the Vault Cache wizard. The wizard may start automatically when you open Outlook. If the wizard does not start automatically, follow the procedure below. You need to run the wizard once only. The wizard sets up your Vault Cache, and starts synchronization for the first time. Synchronization is the process that keeps your Vault Cache up to date with your online vault. You do not need to perform any further setup for Virtual Vault. 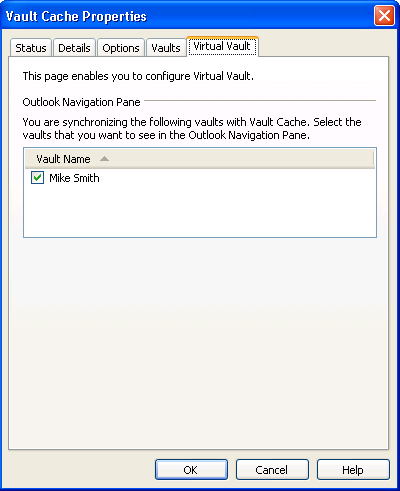 When the first synchronization is complete, your Virtual Vault normally appears in the Outlook Navigation Pane. If it does not appear, you can choose an option to display it. See Showing or hiding your Virtual Vault on page 13. 13 Setting up Enterprise Vault Showing or hiding your Virtual Vault 13 To set up a Vault Cache 1 On the Tools menu, click Enterprise Vault > Enable Vault Cache. The Vault Cache wizard appears. 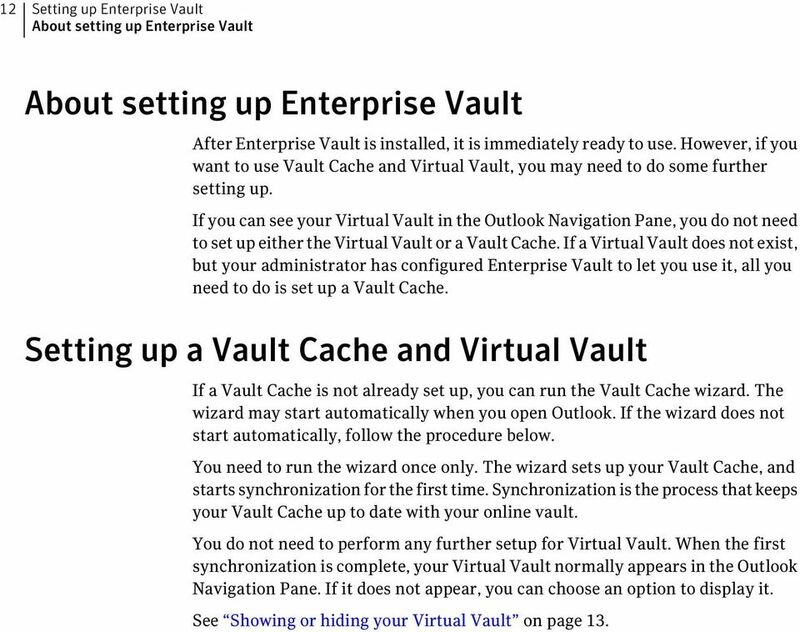 2 On the first page of the Vault Cache wizard, select Set up Vault Cache, and then click Next. 3 If the next page includes the Apply age limit option, choose the maximum age of archived items to download automatically to your Vault Cache. This page appears only if your administrator has configured certain Enterprise Vault options. To apply an age limit, follow these steps: Check Apply age limit. Enter a value for the maximum age of archived items to download automatically to your Vault Cache. Click Next. If you do not want to apply an age limit, uncheck Apply age limit. 4 On the final page, click Finish to start synchronization. Showing or hiding your Virtual Vault Your Virtual Vault normally appears automatically in the Outlook Navigation Pane after your Vault Cache has been set up. However, in some circumstances, you may need to take the following steps to make it visible. 14 14 Setting up Enterprise Vault Turning off Outlook AutoArchive To show or hide your Virtual Vault 1 On the Tools menu, click Enterprise Vault > Vault Cache Properties. 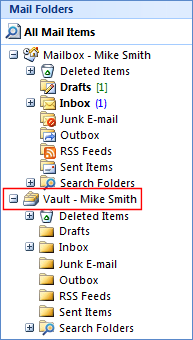 2 On the Virtual Vault tab, check or uncheck your vault name to show or hide it in the Outlook Navigation Pane. 3 Click OK. You can also hide your Virtual Vault by right-clicking it in the Outlook Navigation Pane and then clicking Close. Turning off Outlook AutoArchive Outlook AutoArchive is different from Enterprise Vault archiving. AutoArchive archives items to a personal folder (PST) file. Enterprise Vault archives items to a vault on your network. The archived items can be safely backed up, and you can view, search for, or restore them. Now that you use Enterprise Vault to archive items from your mailbox, we recommend that you turn off AutoArchive. To turn off Outlook AutoArchive 1 In Outlook, click Tools > Options. 2 Click the Other tab. 3 Click AutoArchive. 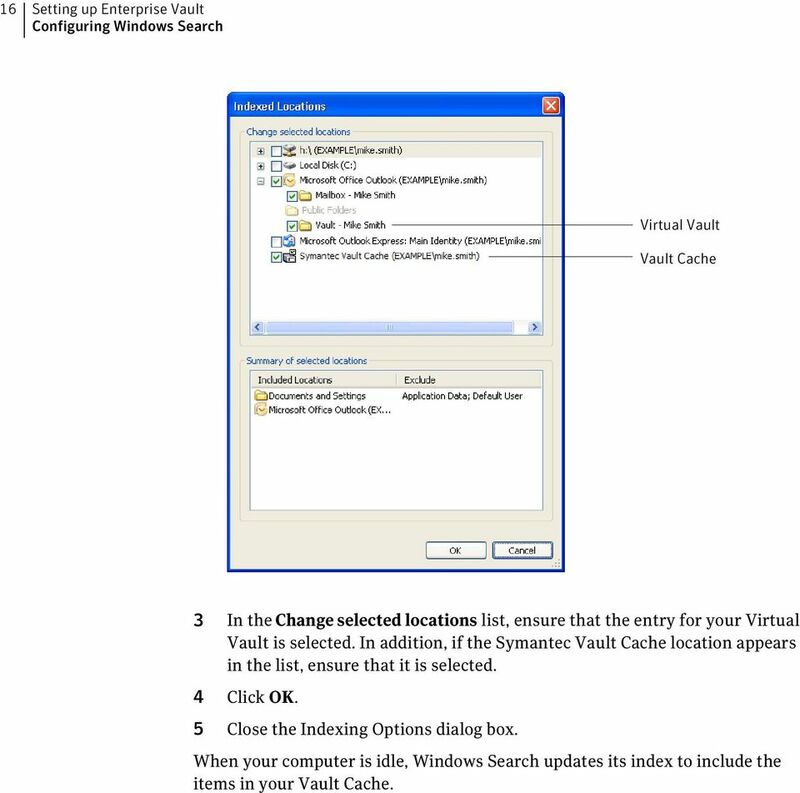 16 16 Setting up Enterprise Vault Configuring Windows Search Virtual Vault Vault Cache 3 In the Change selected locations list, ensure that the entry for your Virtual Vault is selected. In addition, if the Symantec Vault Cache location appears in the list, ensure that it is selected. 4 Click OK. 5 Close the Indexing Options dialog box. When your computer is idle, Windows Search updates its index to include the items in your Vault Cache. 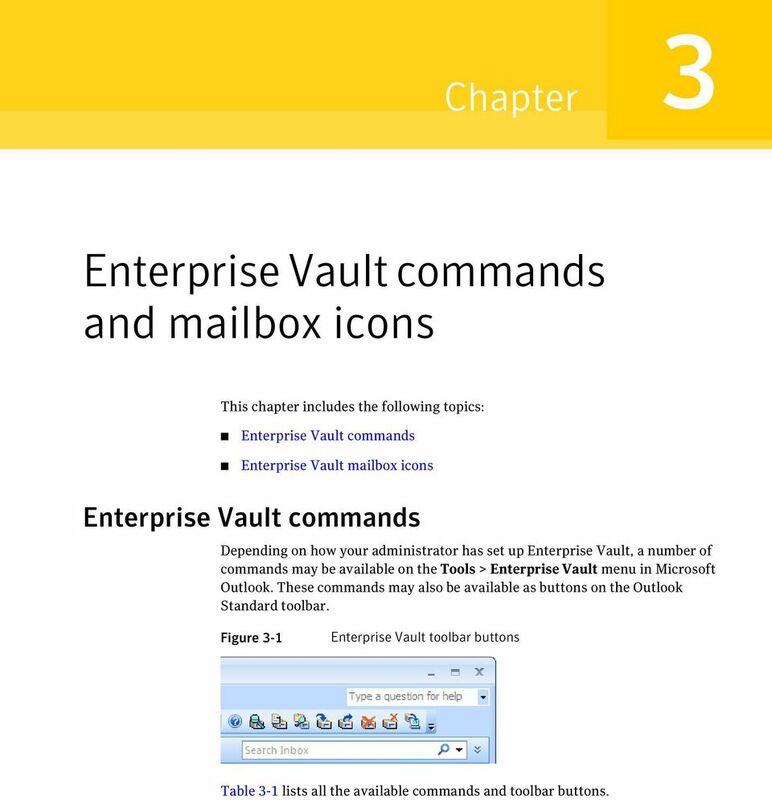 17 Chapter 3 Enterprise Vault commands and mailbox icons This chapter includes the following topics: Enterprise Vault commands Enterprise Vault mailbox icons Enterprise Vault commands Depending on how your administrator has set up Enterprise Vault, a number of commands may be available on the Tools > Enterprise Vault menu in Microsoft Outlook. These commands may also be available as buttons on the Outlook Standard toolbar. Figure 3-1 Enterprise Vault toolbar buttons Table 3-1 lists all the available commands and toolbar buttons. 18 18 Enterprise Vault commands and mailbox icons Enterprise Vault commands Table 3-1 Enterprise Vault commands and toolbar buttons Command Search Vaults Expiry Report Archive Explorer Button Description Search for archived items in the available vaults. See Searching for archived items on page 22. List the items that Enterprise Vault will delete from your vault because their retention period is about to end. If necessary, you can restore selected items to your mailbox. Display a tree view of the items in your vault. Store in Vault Restore from Vault Delete from Vault Cancel Operation Archive the selected items. You can only use this command or button on items in the mailbox, and not on items in Virtual Vault. See Storing items manually on page 25. Restore the items that are associated with the selected Enterprise Vault shortcuts. You can only use this command or button on items in the mailbox, and not on items in Virtual Vault. See Restoring archived items on page 27. Delete archived items. You can only use this command or button on items in the mailbox, and not on items in Virtual Vault. See Deleting archived items on page 22. Cancel the Enterprise Vault operation that is currently in progress. You can cancel the following operations: Delete from Vault Store in Vault Restore from Vault You can only use this command or button on items in the mailbox, and not on items in Virtual Vault. See Canceling deletion of archived items on page 23. See Canceling archiving and restore operations on page 28. 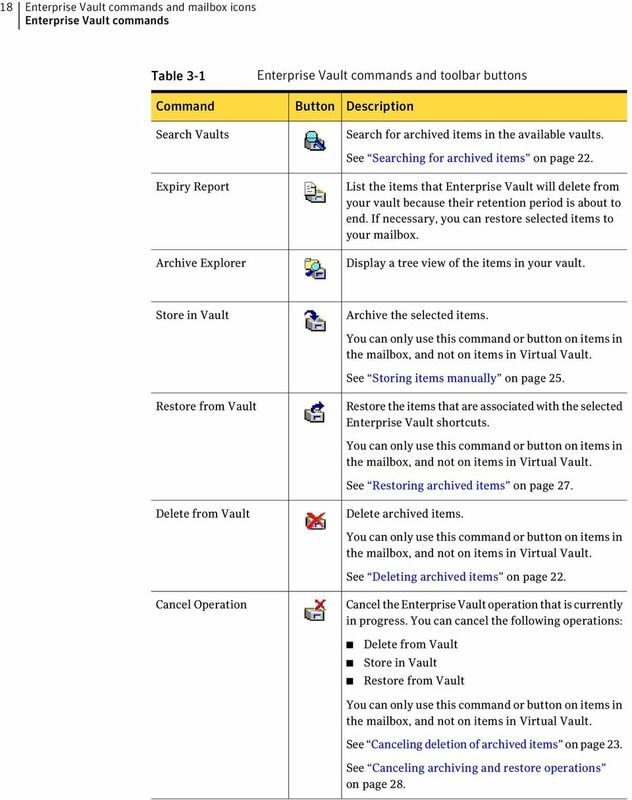 19 Enterprise Vault commands and mailbox icons Enterprise Vault mailbox icons 19 Table 3-1 Enterprise Vault commands and toolbar buttons (continued) Command Synchronize Vault Cache Button Description Synchronize your Vault Cache with your online vault. See Synchronizing your Vault Cache on page 29. Enterprise Vault mailbox icons The items in your Outlook mailbox may be marked with the following icons. 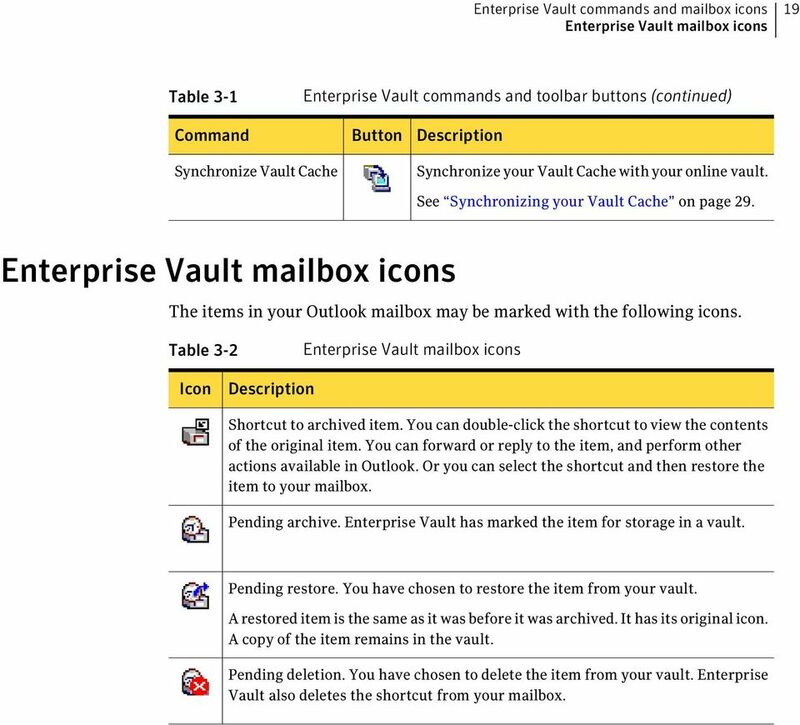 Table 3-2 Enterprise Vault mailbox icons Icon Description Shortcut to archived item. You can double-click the shortcut to view the contents of the original item. You can forward or reply to the item, and perform other actions available in Outlook. Or you can select the shortcut and then restore the item to your mailbox. Pending archive. Enterprise Vault has marked the item for storage in a vault. Pending restore. You have chosen to restore the item from your vault. A restored item is the same as it was before it was archived. It has its original icon. A copy of the item remains in the vault. Pending deletion. You have chosen to delete the item from your vault. Enterprise Vault also deletes the shortcut from your mailbox. 21 Chapter 4 Working with archived items This chapter includes the following topics: Viewing archived items Searching for archived items Replying to and forwarding archived items Deleting archived items Canceling deletion of archived items Viewing archived items When Enterprise Vault archives an item, it may leave a shortcut in your mailbox. The shortcut is a direct link to the archived item. If the item is not immediately available, Enterprise Vault shows the shortcut contents instead. You can then choose to restore the item to your mailbox. You can also view archived items that are in your Virtual Vault. To view an archived item 1 Select the shortcut to the item, or select the item in your Virtual Vault. 2 Use any of the normal Outlook actions to open the item. 22 22 Working with archived items Searching for archived items Searching for archived items After Enterprise Vault has archived an or another Outlook item, you can find the item with Outlook Instant Search. Instant Search finds both archived items in your Virtual Vault and shortcuts in your mailbox. If there is no shortcut to the archived item and you cannot find the item in Virtual Vault, you can use the Enterprise Vault Search Vaults feature. To search for archived items with Search Vaults 1 Click Search Vaults on the toolbar or, on the Tools menu, click Enterprise Vault > Search Vaults. 2 If Enterprise Vault prompts you for your logon details, type them and then click OK. If the logon dialog box does not have a separate Domain field, you must type your user name in the form domain_name\user_name. 3 Enter the search criteria, and then start the search. 4 If required, restore one or more items to the Restored Items folder in your mailbox. The Restored Items folder is an Enterprise Vault folder that is automatically created when you first restore items. For more information on how to use the search facilities, see the online Help that accompanies them. Replying to and forwarding archived items You can reply to or forward an archived item from its shortcut, or from your Virtual Vault. Outlook opens the item in its original form, exactly as it does when you reply to or forward any other item. To reply to or forward an archived item 1 Select the shortcut to the item, or select the item in your Virtual Vault. Note that you can forward multiple archived and non-archived items at once. 2 Use any of the normal Outlook actions to reply to or forward the items. Deleting archived items If your Enterprise Vault administrator has enabled you to delete items from a vault, you can do so in the following ways. You can also delete archived items from within Enterprise Vault search applications. 23 Working with archived items Canceling deletion of archived items 23 You can only delete a folder from Virtual Vault if the folder does not exist in your mailbox. To use shortcuts to delete archived items 1 Select the shortcuts to the archived items that you want to delete. You can include any items that are not shortcuts. Enterprise Vault ignores such items. 2 Click Delete from Vault on the toolbar or, on the Tools menu, click Enterprise Vault > Delete from Vault. 3 Click Yes to confirm that you want to delete both the shortcuts and the archived items. The icons next to the items change to indicate a status of pending deletion. To delete an item that you have opened from a shortcut 1 Click Delete on the toolbar of the opened item's window. 2 Click Yes to confirm that you want to delete the item. 3 If a further prompt appears, choose to delete the shortcut only or both the shortcut and the archived item. If you delete the shortcut only, the item remains in your online vault and you can still retrieve the item from your Virtual Vault. To delete items from a Virtual Vault 1 In a Virtual Vault folder, select the items that you want to delete. 2 On the toolbar or on the right-click menu, click the Outlook option Delete. 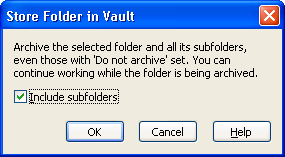 To delete a folder from a Virtual Vault 1 In your Virtual Vault, select the folder that you want to delete. 2 On the toolbar, click the Outlook option Delete. Or, on the right-click menu, click the Outlook option Delete "folder name". 3 In the prompt window that appears, click Yes to confirm the deletion or No to cancel it. Canceling deletion of archived items If an item has a status of pending deletion, you may be able to stop Enterprise Vault completing the operation. 24 24 Working with archived items Canceling deletion of archived items To cancel deletion of an archived item 1 Select the items for which you want to cancel deletion. You can include any items that Enterprise Vault is not processing. Enterprise Vault ignores such items. 2 Click Cancel Operation on the toolbar or, on the Tools menu, click Enterprise Vault > Cancel Operation. 25 Chapter 5 Storing and restoring items This chapter includes the following topics: Storing items manually Storing folders manually Restoring archived items Canceling archiving and restore operations Storing items manually Enterprise Vault performs automatic archiving in the background, and does not require any action from you. However, there may be occasions when you want to store one or more items in your vault manually. You can store items manually if your administrator has set up Enterprise Vault to permit it. You can use the Enterprise Vault options in Outlook to store items. You can also move or copy items to your Virtual Vault to store them. If you store an item by moving or copying it into your Virtual Vault, you cannot cancel the archiving operation. To store items from an Exchange managed folder, you must use the Enterprise Vault options. You can only store these items if your administrator has enabled archiving of Exchange managed folders. Note that you cannot modify the contents of Exchange managed folders in your Virtual Vault. To store items using Enterprise Vault options 1 In your mailbox, select one or more items to store. 2 Click Store in Vault on the toolbar or, on the Tools menu, click Enterprise Vault > Store in Vault. 3 Click OK.
26 26 Storing and restoring items Storing folders manually To store items using Virtual Vault 1 Select one or more items to store. 2 Use any of the normal Outlook actions to move or copy the items into your Virtual Vault. For example, you can store the items in the following ways: To move the items, drag them into the Virtual Vault folder where you want to store them. Or right-click them, and then click Move to Folder and select a Virtual Vault folder in the Move Items dialog box. To copy the items, hold down Ctrl and drag them into the Virtual Vault folder where you want to store them. Storing folders manually Enterprise Vault performs automatic archiving in the background, and does not require any action from you. However, there may be occasions when you want to store a complete folder in your vault manually. You can select the entire contents of the folder and store the items manually. Alternatively, you can store a folder if your administrator has set up Enterprise Vault to permit it. You cannot store a complete mailbox. You can use the Enterprise Vault options in Outlook to store a folder. You can also move or copy a folder to your Virtual Vault to store it. To store a folder using Enterprise Vault options 1 Select the folder to store. 2 Click Store in Vault on the toolbar or, on the Tools menu, click Enterprise Vault > Store in Vault. The Store Folder in Vault dialog box appears. 3 Check or uncheck Include subfolders. 4 Click OK.
27 Storing and restoring items Restoring archived items 27 To store a folder using Virtual Vault 1 Select a folder to store. 2 Use any of the normal Outlook actions to move or copy the folder into your Virtual Vault. For example, you can store the folder in the following ways: To move the folder, right-click it. Then click Move "folder name" and select a Virtual Vault folder in the Move Folder dialog box. To copy the folder, right-click it. Then click Copy"folder name" and select a Virtual Vault folder in the Copy Folder dialog box. Restoring archived items You do not normally need to restore archived items to your mailbox, as you can view them easily from their shortcuts or from Virtual Vault. If you do restore items, they are restored in their original format. For example, if a restored item is a mail message, you can still reply as normal. You can restore archived items in either of the following ways: By using their shortcuts. Items that you restore from shortcuts are always restored to the current folder (where the shortcuts are). 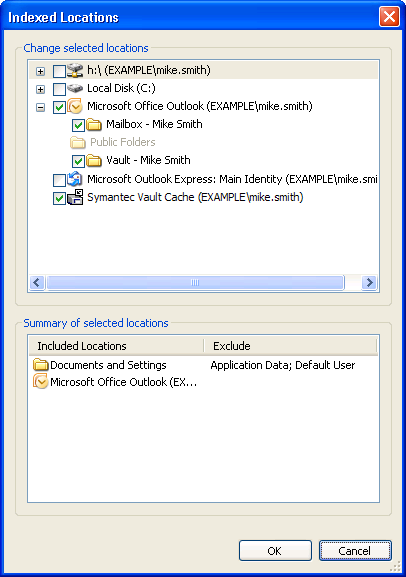 By using the normal Outlook actions to copy or move the items from your Virtual Vault to your mailbox. If you want to restore items to a public folder, you must have Owner access to the folder. If you do not have Owner access, you can copy a shortcut from a public folder to your mailbox. Then you can restore the item to your mailbox. Enterprise Vault may take some time to restore any items that are stored offline. To restore archived items from shortcuts 1 If the shortcuts are in a public folder or a PST file, copy them to a folder in your mailbox. 2 In your mailbox, select shortcuts to items that you want to restore. Use the normal Outlook selection to select single or multiple shortcuts. You can include any items that are not shortcuts. Enterprise Vault ignores such items. 3 Click Restore from Vault on the toolbar or, on the Tools menu, click Enterprise Vault > Restore from Vault. 4 Click OK to confirm that you want to restore the items. The original items are restored to your mailbox. 28 28 Storing and restoring items Canceling archiving and restore operations To restore archived items from a Virtual Vault 1 In your Virtual Vault, select the items that you want to restore. Use the normal Outlook selection to select single or multiple items. 2 Use any of the normal Outlook actions to move or copy the items into your mailbox. For example, you can restore the items in the following ways: To move the items, drag them into the mailbox folder where you want to restore them. Or right-click them, and then click Move to Folder and select a mailbox folder in the Move Items dialog box. To copy the items, hold down Ctrl and drag them into the mailbox folder where you want to restore them. Canceling archiving and restore operations If an item in your mailbox has a status of pending archive or pending restore, you may be able to stop Enterprise Vault from completing the operation. You do not normally need to cancel archiving and restore operations. If you want to open an item that has a status of pending archive or pending restore, you can double-click it. You cannot cancel archiving and restore operations on items in your Virtual Vault. To cancel archiving and restore operations 1 Select the items for which you want to cancel the operation. You can include any items that Enterprise Vault is not processing. Enterprise Vault ignores such items. 2 Click Cancel Operation on the toolbar or, on the Tools menu, click Enterprise Vault > Cancel Operation. 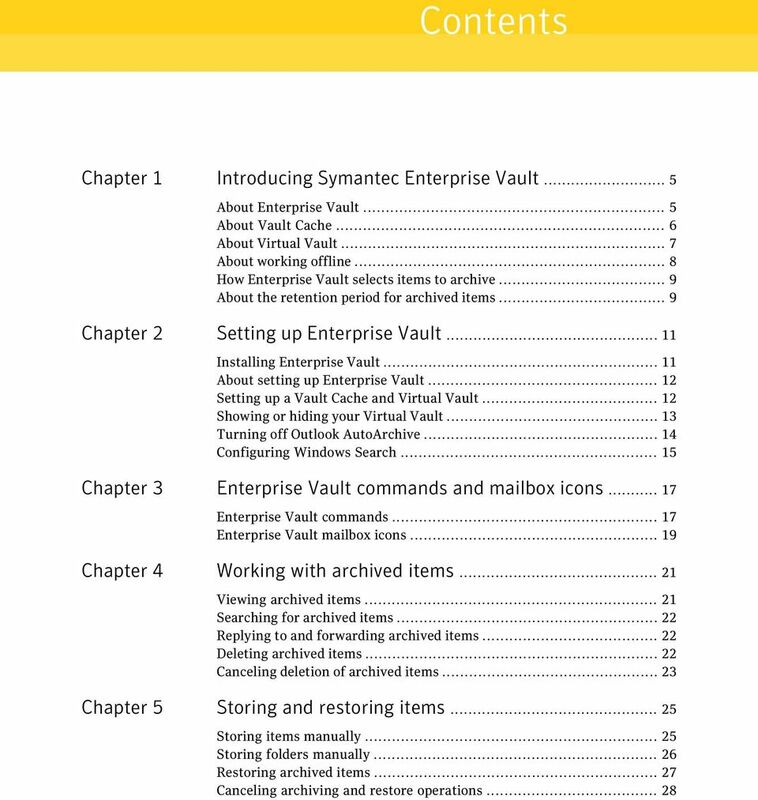 29 Chapter 6 Managing Enterprise Vault archiving This chapter includes the following topics: Synchronizing your Vault Cache Viewing and changing Vault Cache properties Suspending or enabling archiving for your mailbox Synchronizing your Vault Cache Enterprise Vault keeps your Vault Cache up to date by synchronizing it with the online vault that is associated with your Outlook mailbox. The administrator may also have configured Enterprise Vault so that you can do the following: Synchronize the Vault Cache yourself at any time. Suspend synchronization. When you suspend synchronization, any current synchronization process stops and Enterprise Vault does not perform any further updates to your Vault Cache. Note: Synchronization remains suspended even if you stop and restart Outlook, until you choose to resume synchronization. Synchronize your Vault Cache with additional vaults to which you have access. Enterprise Vault automatically determines which items to download to your Vault Cache. 30 30 Managing Enterprise Vault archiving Synchronizing your Vault Cache To synchronize your Vault Cache Click Synchronize Vault Cache on the toolbar or, on the Tools menu, click Enterprise Vault > Synchronize Vault Cache. 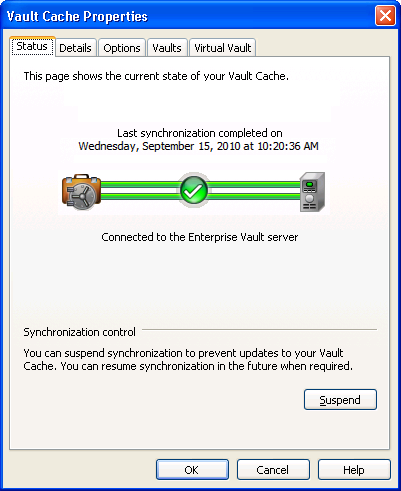 The Vault Cache Synchronization dialog box appears. 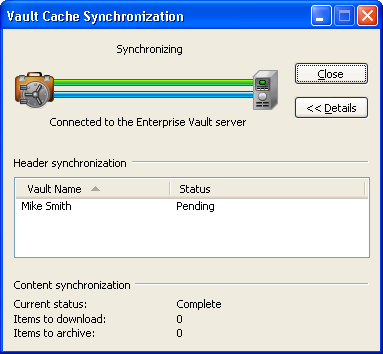 The Vault Cache Synchronization dialog box provides summary information about the synchronization process. You can close the dialog box while synchronization is in progress, and continue to work with Outlook. 31 Managing Enterprise Vault archiving Synchronizing your Vault Cache 31 To suspend or resume synchronization 1 On the Tools menu, click Enterprise Vault > Vault Cache Properties. 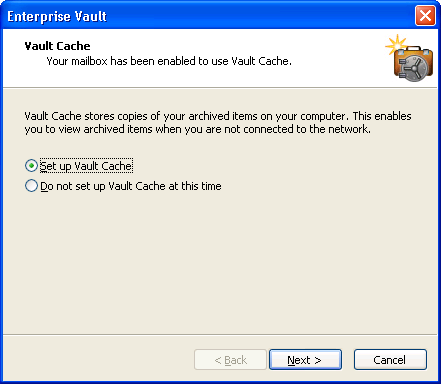 The Vault Cache Properties dialog box appears. 2 In the Vault Cache Properties dialog box, on the Status tab, click Suspend or Resume. 32 32 Managing Enterprise Vault archiving Viewing and changing Vault Cache properties To choose additional vaults to synchronize with 1 On the Tools menu, click Enterprise Vault > Vault Cache Properties. 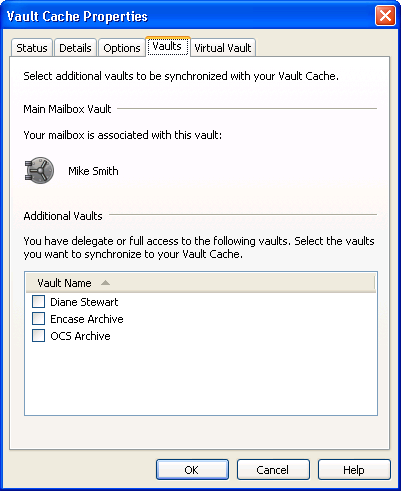 2 In the Vault Cache Properties dialog box, click the Vaults tab. If there is no Vaults tab, the administrator has not enabled this feature. 3 To choose an additional vault, check the box next to its name. 4 Click OK. The additional vault appears in your Virtual Vault after the synchronization process has ended. Viewing and changing Vault Cache properties The Vault Cache Properties dialog box can contain up to five tabbed pages. The administrator controls which tabs are included in the dialog box. If the appropriate tabs are available, the Vault Cache Properties dialog box lets you do the following: Suspend or resume synchronization. Start synchronization. View synchronization progress. Set the disk space to use for the content of items in your Vault Cache. Policy Based Encryption Essentials Administrator Guide Policy Based Encryption Essentials Administrator Guide Documentation version: 1.0 Legal Notice Copyright 2015 Symantec Corporation. All rights reserved. 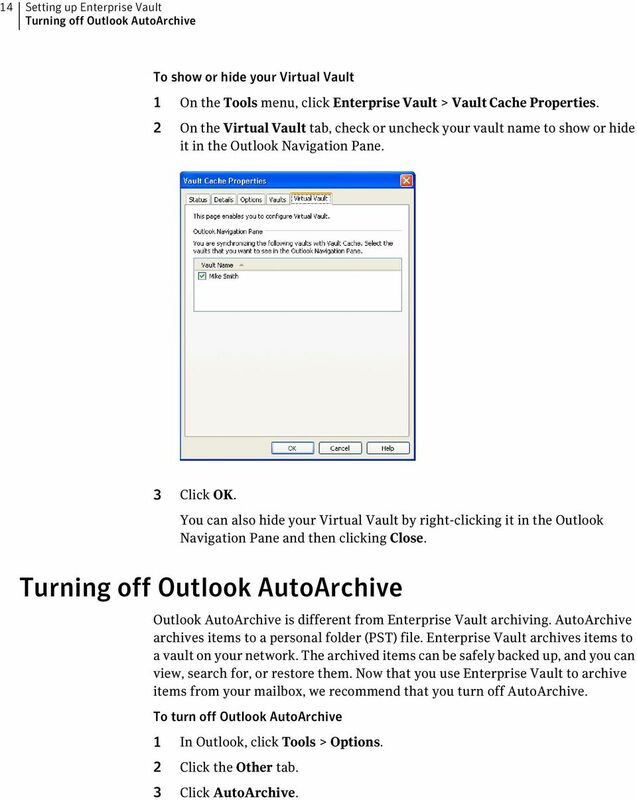 Enterprise Vault Instructions for Saving Items from an archive restored to a secondary mailbox in Microsoft Outlook The following instructions were created using Microsoft Outlook 2013 on a Windows 7 computer. ELM Server Exchange Edition Virtual Archive Mailbox version 5.5 Copyright 2016 Lexmark. All rights reserved. Lexmark is a trademark of Lexmark International, Inc., registered in the U.S. and/or other countries. A Presentation of TeachUcomp Incorporated. Copyright TeachUcomp, Inc. 2013. Mastering Outlook Made Easy for Lawyers CPE Edition v.2.